Parts is Parts | Tennessee Aircraft Services, Inc.
“Let me be sure I understand you correctly, my plane has a WRONG wing installed and you say it’s unairworthy?” That may sound like a nearly impossible statement, but it’s been said to me by at least three different Cessna owners. It can be an even more difficult pill to swallow if you’ve owned the plane in that condition for many years. How did this happen, and what can be done? One of the work items required during an annual inspection is to determine that the airplane conforms to its type design. The mechanic with Inspector Authorization you hired to perform your inspection compares the physical airplane with the one described in the FAA Type Certificate Data Sheets (TCDS). It requires someone knowledgeable in your specific model to find the differences not within the TCDS, and it happens more frequently than you might think. 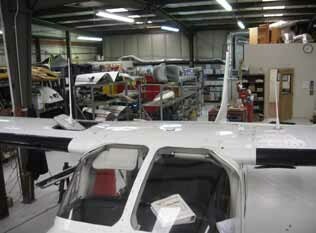 You can find TCDS for your plane on the FAA website at www.faa.gov. The FAA web site is not particularly user friendly, but we’ll cut them some slack due to the huge volume of information they are presenting. On the left lower side of the home page, select the “Mechanic” button. Once on the Mechanic page, select the link to Type Certificate Data Sheets under the heading of Aircraft and Technical Information. Now you have to navigate through the make/model options to get to your plane, click on the link, and open the *.pdf file. I’m sure the internet adept will find a shorter route, but this one works for me. In the TCDS you’ll find information specific to your plane including certain accessories, equipment, and documents that must be on, in, or attached to the plane. You can determine if you have the correct engine, propeller, placards, aircraft flight manual, fuel, max RPM, CG range, GTOW, which cylinder gets the temperature gauge and more. Of course, your plane may be different than the TCDS if it was altered in accordance with a Supplemental Type Certificate (STC). These are approved alterations to your plane that allow it to deviate from the original TCDS. What is interesting is how much is NOT in the TCDS. Information like which tire, elevator, battery, rudder, or wing is correct for a particular model of the 172. The changes from year models are often difficult to detect, but may be significant from an airworthiness standpoint. A right wing from a 1968 172 might bolt right on a 2006 172 model, but it sure wouldn’t match the type design. As it turns out, we see wrong assemblies on planes from time to time, and it’s always an amazement -note I didn’t say amusement. The three worst I’ve seen have had to do with Cessna 210s flying with the wrong wings. A request to Cessna for approval to install a slightly different wing on a plane than what it was delivered with has occurred enough times that they have a form letter in response. The short of the letter is that a wing is considered interchangeable if it’s from the same basic model airplane, has the same or higher gross weight allowance, and is the same airfoil. That’s it. That still leaves room for differences in fuel systems, electrical, flap actuating, dihedral, or even stall indicating. So, just because you can use a wing doesn’t mean some changes won’t have to be made to match the details. Cessna moved from the strutted wing to a cantilever design on the 210 series in 1967 and used a three degree dihedral. The first one hundred or so wings had flush rivets on the inboard spar caps to hold the skins in place. In 1969 Cessna moved to a 1.5 degree dihedral which was achieved by changes in the wing attachment forgings (not the cabin carry through). These first three years’ models all have a 3400 pound gross weight limit. The parts manual for the cantilever model 210 series does not have a part number for the inboard leading edge skin. This is due to the fact that the leading edge is an integral part of the fuel tank. During the production process the tank was constructed as a separate assembly, and then attached to the rest of the structure. In the 210 service manual there are statements about fuel tank skin repairs not being practical, and replacement of the entire tank assembly is recommended. How that is less work than replacing the skin I have yet to determine. The earliest cantilever wing only had two fuel tank access panels. That quickly changed to three access panels, likely just after the hard working folks applying the tank sealant on the assembly line mutinied about the difficulty sealing such a long narrow tank through two access holes. It’s still a monumental pain to work in these tanks, but someone decided three was the right number and Cessna stuck with that until production ceased in 1986, with the exception of the long range version on the R model. The airplane’s gross weight increased to 3800 pounds in 1970. There were some significant structural improvements from the 1967 to the 1968 model but very little from the 1969 to the 1970. The wing spar carry through for all 210 models uses the same basic assembly, so that wouldn’t account for a 400 pound gross weight increase. I suspect the earlier structural improvements combined with the greater horse power engine installed in 1970 accounts for the increase. The landing and taxi lights are mounted in the most outboard portion of the wing leading edge beginning with the first cantilever wing. Cessna moved them to the cowling in the beginning of the 1972 year model. The 210 was usually packed with all the latest avionics equipment. In the earlier days this meant lots of remote mounted boxes and not much space in which to mount them. Some brilliant designer realized there was some unused space in the wings just inboard of the fuel bay. Cessna installed an avionics bay in that area beginning in 1970 which continued through the end of the 1975 year model and continued as an option until the end of 1977. Each bay had a large removable panel on top of the wing. removed and positioned out of place so it shows more obviously in the photo. The left wing has no panel at all. There were a couple of changes in the shape and placement of the cabin air inlet port as well. 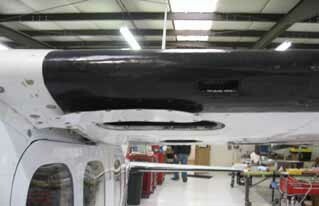 This is the rectangular or triangular shaped hole in the wing leading edge about a foot outboard of the cabin. From 1970 through 1977, the air inlet was rectangular in shape and cut out in the apex of the leading edge. In 1978 the inlet stayed rectangular but was dropped down below the apex. It stayed in that position through 1984. The last two years of production didn’t have this vent hole. There are a whole slew of other minor changes that occurred inside the wing that can’t be seen during a general walk around of the plane. The external visible variations of the wings are sufficient to locate a wing’s original year model pretty closely. This is important because it’s so easy to change wings, and it’s important to know if the installed wings are appropriate to the year model of the plane. You care because the wing from a 1974 210L will bolt right on a 1978 P210, but it’s doesn’t meet Cessna’s criteria for wing replacement, and it doesn’t conform to the original design. The 1974 wing is certified to 3800 pounds gross weight while the P210 requires a 4000 pound gross weight wing. The final word is the plane is not airworthy. 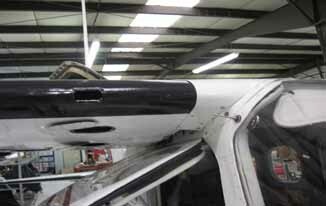 The P210 wing mismatch was discovered during a first time annual at our shop. Deice boots cloaked the visual difference in the cabin air vent locations. The inspector was looking at the top of the wing for possible tank access panel leaks when he noticed the right VHF communication antenna was mounted in a removable panel and the left wasn’t. Further investigation revealed the incorrect right wing had been installed twenty years before. In subsequent inspections, it had never been noticed, or at least no one admitted to it. The rectangle shaped hole just below the leading edge apex in this left wing is the correct location for this P210N. The rectangle shaped hole centered on the leading edge apex in this right wing is NOT the correct location for this P210N. A wing from a 1968 210H bolts on a 1969 210J has the same gross weight capability, but the two wings have different dihedrals. It is an easy argument to make that this combination is perfectly legal. Gross weight capability is the same, airfoil is the same and the structure is equivalent, so Cessna’s requirements are met. If you don’t mind one wing tip being 6 inches higher than the other, all is well. You’ll never notice a bit of difference in the way it flies; I tell you this from personal experience. The 210J wing mismatch was detected when someone easily walked under the left wing tip then bumped his head on the right. Surely it must be the hangar floor is uneven! Several movements around the hangar and then out on the ramp confirmed our fears. It’s just not always as obvious to see as you might think. A pair of wings from a 1968 210H fit just fine on a 1980 210N. Several wiring and plumbing changes must be made, but it works. The older wings have the three degree dihedral instead of 1.5, but since they both have it, all is nice and balanced. Unfortunately, the 600 pound difference in certified gross weight makes this alteration unairworthy. One could try to persuade some unsuspecting FAA Maintenance Inspector to sign off on a field approval, a very unlikely scenario. One might also find a Designated Engineering Representative (DER) to generate approved data for such a change, also unlikely. The lower certified gross takeoff weight of the inappropriately installed wing is the sticking point. The expensive answer, but the most plausible, is to find a proper wing and install it. They can be hard to find, but diligence can pay off. There will be lots of parts to swap over, including flight controls, bell cranks, fuel senders, wing tips, and pitot tube. You’ll probably have to paint it to keep folks from asking why you have the different color wings. You’ll also have the unknown of a different fuel tank and won’t know if it leaks until you add fuel. Total cost including wing, labor and materials will start at a likely minimum of about $12,000 and can easily pass the $18,000 mark. The best answer is to find the problem before it’s yours. By that I mean having a proper repurchase evaluation performed by a mechanic/shop with known expertise on the specific model Cessna you are purchasing. Of course, most of you reading this already own a Cessna and may be thinking ignorance is bliss. I feel knowledge is power, so take the plunge and have the plane looked over specifically for model specific conformity by an expert. If nothing wrong is found, the bliss level will be even greater.